What was your inspire ration for writing Yield? I was on a plane from San Francisco to Bend for a job interview over six years ago, and the fog was so thick over the bay that it completely blotted out the sky. As we took off above the cloud bank, everything just disappeared beneath me. Mankind and all our worries seemed to fade into the grey. I wondered what would happen if the world changed at that very moment. What if the life I knew didn’t exist when I landed? What if my world died somewhere under those clouds? That experience started my entire thought process, and even turned into one of my favorite scenes in Yield. As the main character, disgraced fire-fighter Devin Bane, takes off on the way towards his own interview, everything he knows changes while he’s in the air. Devin crashes headfirst into a chaos he doesn’t understand, fighting not only to get back to his wife and kids, but also to protect the other survivors now looking to him for a leadership he wants no part of. Was it easy to imagine an apocalyptical world? Pieces of it were. I’m a very visual person. I love drawing, painting, and have twelve-plus years of experience inside the television industry directing and producing. That visual sense I think translates into my writing. I’m able to see the details of my scenes and characters very clearly, even a chaotic and apocalyptic world like Yield‘s. I try to set up each chapter and scene for my readers as a director would, with establishing shots, cutaways, and intense action sequences. That creative background gets channelled when I write in sometimes very interesting ways. While you were writing, did you ever find yourself stuck? I think everyone gets stuck from time to time. Some days the words are flowing and it’s all I can do to keep up with them. Other days, they can’t be beaten out of me with a sledge hammer. If I’m stumped, I’ll jump to a different part of the story or take a step back and try to look from a more macro perspective. Is it a local issue or is there a broader plot, character, or flow problem that needs addressing? Looking a page or two ahead of where I’m blocked and working down from there I also find helpful because it reorients me back to the broader story and helps to show the problem area in context. Did you use any real situation or real fact as a guide in your book? I integrated some contemporary news headlines into the narrative to give it a greater sense of relevance and realism. Aside from that, I really wanted to take the story down a very personal and dramatic road—one that was uniquely gripping and terrifyingly real. Everything is just a step or two past where we are now. I love science fiction and fantasy, but didn’t want Yield to have that fantastical and unbelievable quality to it. I wanted the story to feel horrifyingly possible in every way. What would you do if you have to face a situation like the one in your book? That’s a great question! I honestly don’t know. No one really can until they’re thrown into such a life-threatening and chaotic scenario. We’d all like to think that we would be the heroic ones, helping others and holding fast to our morals. One of the most honest and interesting aspects of Yield I feel is the struggle of internal demons and doubt inside all of the story’s characters. Heroism comes at a cost, either to yourself or those you care about. Yield‘s very flawed and sometimes unwilling protagonist, Devin Bane, runs up against that time and time again, trying to come to grips with his own instincts to protect and care for those around him, but also knowing that his own family may be suffering and in desperate need miles away. That is such a difficult choice to make, but a very real one with irreversible implications either way. It took six years for Yield to be released, what were your feelings during that long process? Did you ever think about giving up? Six years is a long time, and I honestly did think about giving up a few times along the way. I thought the concept made for a very visual type of story, so I initially fleshed out Yield in a screenplay format. That alone took me a couple of years because I was working on it after long days at work and time with my family. Putting it together as a screenplay actually helped me quite a bit while writing to better visualize the scenes, structure the story, and tighten up my dialogue. But screenplays have to be so concise and heavily formatted that it really limited the emotion of the story. I received a lot of feedback from prospective agents and production companies that the screenplay was overwritten and just too literary. So I took a deep breath and jumped in with both feet to expand Yield out into a novel. It took a few more years, but was extremely liberating to be able to flesh out how my characters felt and thought—how the fear inside them was palpable and crippling. It allowed me to explore my own style of writing and create a much deeper story. Because of that multi-formatted process and my own inexperience as a novelist, it took four times as long to finish the story as it probably should have. Every time I read it I also found different things I just had to rework. I would change my changes, then change them back. I was absolutely bipolar at times. I’m a perfectionist, so I was never completely satisfied. Eventually I just had to push it all away and say the book was done—for my own sanity, if nothing else. Then, of course after I read the printed ARC, I had 80+ more changes for my publisher! Looking back, though, editing is really where my story and writing found its voice. I am grateful now for the extra time I spent on Yield. As a new writer, it can be intimidating because it sometimes feels like the story will never truly be done. But after six years, I’m proof that with a little determination and tenacity, that cover can finally be closed. Did you know from the start that you wanted to write a series? From page one, I knew that the Armageddon story would stretch across at least three parts. To do it right, I knew it had to depict the epic journey and transformation of not only the characters, but also our country and world. There was just no way the story could fit into a single instalment. Books two and three of the Armageddon Series should be released in 2013 and 2014, respectively. You are already working on the sequel. How is that going? I love the direction book two of the Armageddon Series is going. I feel like I learned a lot while writing Yield, and that’s helped my process on book two tremendously. 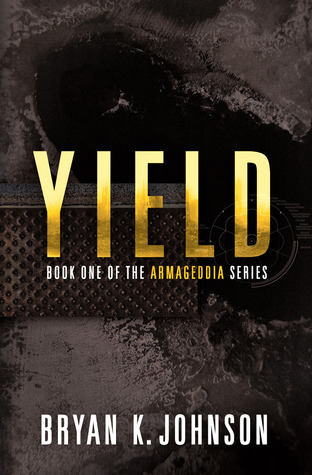 The follow-up to Yield explores a darkening world, one filled with revenge, retribution, and a desperate struggle to find hope within the chaos. Book one saw a cataclysmic shift away from everything we’ve ever known. It was very sudden and immediate in the lives of the characters. Book two of the Armageddon Series takes place a year later, and is more about the sustained struggle to survive—and how the characters have changed in very different ways to do just that. What would you say to those who want to read Yield? At its core, I would say that Yield is a journey of self-destruction and redemption. When our country’s entire infrastructure is crippled by a brutal attack, the survivors are thrown into an unthinkable world full of chaos and anarchy. We’re thrust right into the middle of that madness with the characters, without understanding what happened or why. Yield is a story about that shift between the life we know and the very dark world that emerges from the ashes. If everything you knew suddenly changed in a flash of hatred and violence, how would you react? What would you be capable of to protect the ones you love? Yield‘s characters come face to face with those extremes of humanity, trying to overcome their own savagery and demons while fighting to survive.